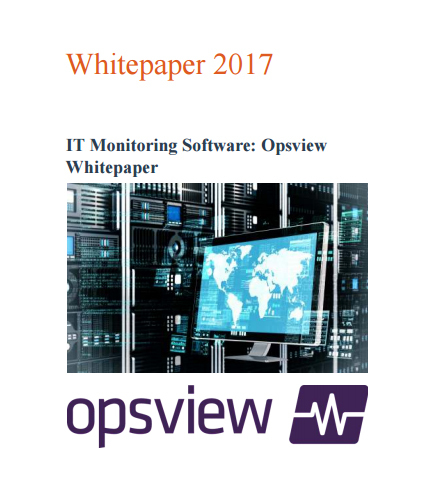 "IT Monitoring Software: Opsview Whitepaper 2017"
In the present scenario, the field of IT monitoring has become very good at collecting status information and performance metrics from various endpoints. However, executive stakeholders are much more interested in the performance of people and processes than of CPU, memory, and throughput. With the new ability to model your applications and business services inside the monitoring tool, this business continuity measure is now a key artifact to contribute to the completeness of an Enterprise Architecture. This whitepaper provides insights on the needs of the market for IT monitoring software that understands the anatomy of the application it seeks to protect. How has the Market Responded? In the publishing industry, the rise of technology has extended beyond publishers simply digitizing content for those readers who prefer ebooks or online learning systems to print—forcing businesses to adapt their processes and products to accommodate new customer demand. In this new age, technology has allowed for many of these processes to be streamlined or automated, allowing for publishers to improve the efficiency of their business and take advantage of opportunities in the marketplace. For publishers of all types to continue to be successful in this new digital world, they must examine all of their systems and evolve to a more efficient way of handling their business. What is the use of Digital Supply Chain? What is the impact of Digital Supply Chain and ERP on content publishing? What is the future of Digital World with streamlining and acceleration? Move ahead and read the following whitepaper that will address all your questions, including these: How to better manage print and digital production schedules? What are the benefits of automating rights and royalty management? What are the best ways to take advantage of print-on-demand and custom publishing? How to repackage digital content to create a new product? How embracing the digital supply chain helps to streamline, automate, and accelerate organizational supply chain?